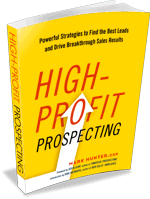 Everyone wants a full sales pipeline. There’s not a sales manager in the world who isn’t continually beating up their sales team to get more into their pipeline. News flash! It doesn’t matter what you put into your sales pipe that counts! What counts is the speed with which it moves through the pipe! The speed it moves through the pipe is what’s going to determine what comes out in sales. If your sales pipeline is like most, then what you have in it is a lot of junk, and it’s there only because your sales manager will rip you apart if you have anything but a full pipe. It’s time we get real and quit putting into our pipe leads that aren’t going anywhere. This is more important than ever as we get closer to the 4th Qtr., when time becomes really precious in trying to close sales to make the annual number. If it’s not a qualified lead, then get rid of it. Stand up to your manager and say what you’ve wanted to tell them for years about how having to deal with junk in the pipeline is slowing you down. Nobody is saying to walk away from leads that could become customers. What I’m saying is we can’t afford to spend our time with leads that are years away from becoming a customer. Which would you rather be doing — spending time with a high-qualified prospect who you can turn into a customer or with a questionable lead? In the NFL, do teams keep 200 players on their roster thinking one of them might turn into the next Tom Brady? No, the NFL dictates they can only keep 53 on their roster. Why? It’s simple economics. They only want to keep the absolute minimum number of players they feel is necessary to win over the course of the season. The same goes for you. Are you more concerned about trying to keep 200 or focusing on the 53 who will make it happen? Make it your job right now to skinny down the number of leads you’re actively working, and yes, that means having the tough talk you know you need to have with your boss. The plan is simple — it’s the speed with which customers come out the bottom of your pipeline that counts, not what goes in at the top. PrevPreviousSelling to the C-Suite: How Do I Get Started? This is awesome! I completely agree, for my first 4ish months doing sales funnels we kept the potential clients who were not closing in the pipeline for up to 90 days! That is way too long and I spent way too many phone calls calling them back. I’m going to shorten he window from first presentation to when we put that potential client aside because it really is time consuming! On another note, I was just gifted your book. I’m very excited to read it and learn from it. Thank you Mark!